My dog-eared copy of Patricia Well‘s Bistro Cooking is broken in the spine at the page for her near perfect Gateau au Citron. 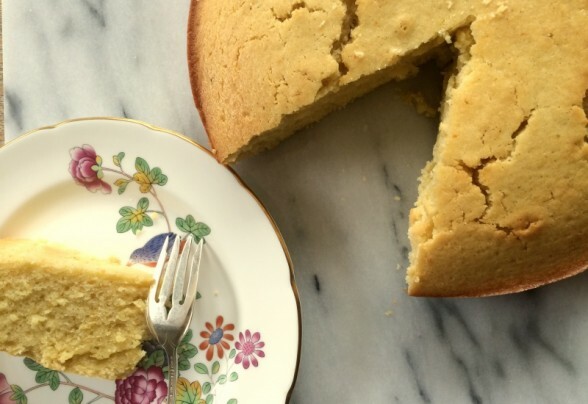 I’ve made this cake so many times I shouldn’t have to look at the recipe, but it’s there, like a nice security blanket, reassuring me with all the adaptations I’ve made through the years. The key to this cake is creme fraiche, loads of lemon zest and fresh lemon juice. Recently I made a version using Yuzu lemons which won the prize as being the favorite. Meyer lemon is the close second. Once I substituted sour cream as I didn’t have any creme fraiche and the cake just wasn’t as good. You could try adding a few tablespons of heavy cream to the sour cream (to reduce the “sour” and lighten the consistency) if purchasing creme fraiche isn’t an option. Well’s recipe says you can substitute heavy cream for the creme fraiche. I have yet to try this and wonder how it will differ in consistency. My adaptation: Wells’ recipe calls for vanilla sugar but I use an 1/8 tsp. vanilla bean powder. Vermont Creamery makes a really nice creme fraiche. I accidentally bought the vanilla bean variety. I still added the vanilla bean powder and the result was heavenly, but it’s not necessary. Anyway you make it, this cake is always delicious. Good on its own but taken up a notch with freshly poached pears or with ice cream or sorbet. Combine the flour and baking powder. Beat the eggs with the sugar on low speed until the eggs and sugar are well blended. You could do this by hand. Now add the creme fraiche, then flour mixture, then the melted butter, and finally the lemon juice and zest. Beat until very smooth. Pour into the pan and bake for 50 to 60 minutes. The cake is done when a tooth pick comes out clean when inserted in the middle. Allow to cool for about 20 minutes before removing from pan(s). In this recipe, baking soda is listed twice. Is the second one to be deleted or is there also baking powder and it’s a typo? Opps! Good catch. It’s a typo. Thanks for pointng it out.